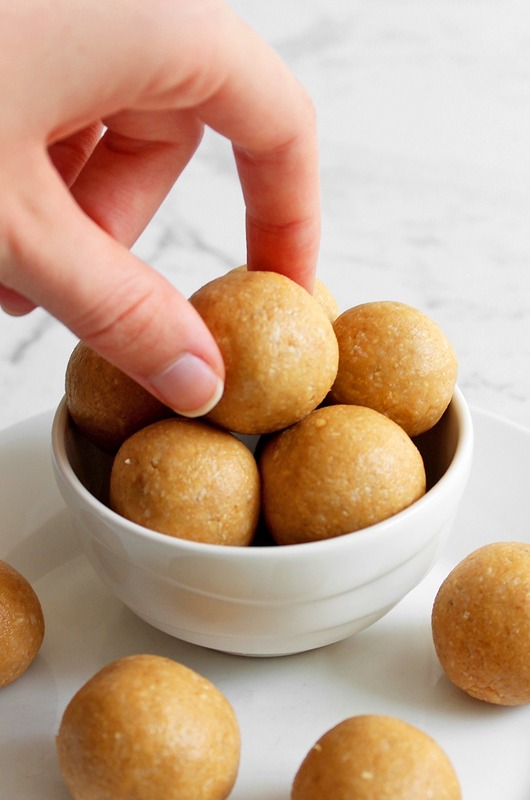 These peanut butter protein bites are the perfect little energy-filled snack and ideal for meal prepping. They don’t require a food processor and only use 4 simple ingredients making them super easy to whip up. I try to have some type of healthy home-made snacks like bliss balls or granola bars in the fridge as often as possible. 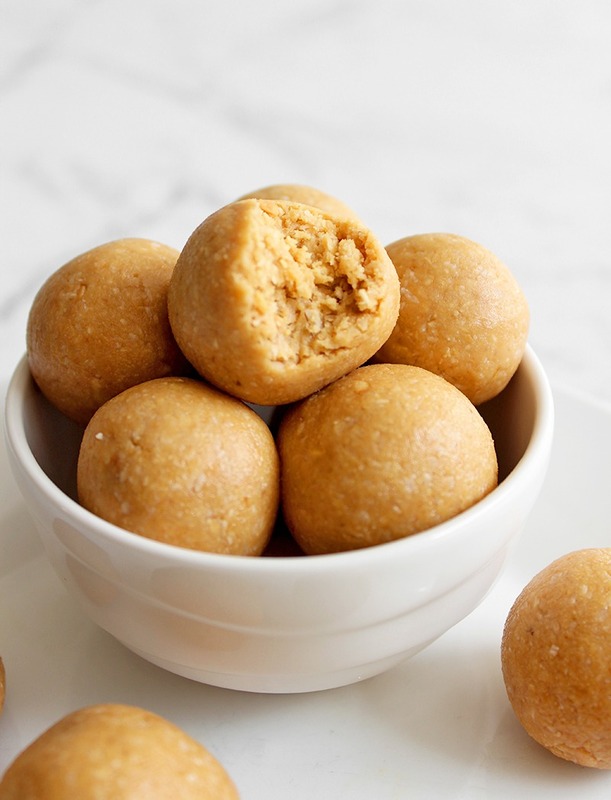 I love snacking and honestly could graze all day long if I let myself, so as long as there’s something healthy like these peanut butter protein bites I won’t crave any undesirables. These protein bites are incredibly easy and quick to put together and that’s why I say they’re perfect for meal prep, they’ll take you about 15 minutes to prep a healthy little snack for the week. You could even make things a little more interesting for yourself by preparing a couple of batches and adding a new ingredient into each one. Like maybe mini choc chips, cranberries or a dollop strawberry jam in the centre… uh, yum! Start by adding all of your ingredients into a mixing bowl and use a wooden spoon to start mixing everything together. It’ll become nice and thick and may even get a little too thick to continue, at this point ditch the wooden spoon and use your hands if it still needs a little more mixing. The warmth of your hands will make it much easier to finish combining everything. Next, simply take a tablespoon measuring spoon or something approximately that size so that all your protein bites are the same size and use that to scoop out the mixture. Then use your hands to gently roll it into little balls and continue with the rest of the mixture. You can store these in a container or glass jar in the fridge for up to a week or the freezer for longer. Take them on road trips, hikes, to the gym, shopping… basically anywhere to prevent you from buying snacks while you’re out and about. 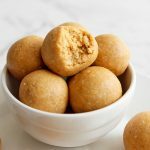 Plan on making these Peanut Butter Protein Bites? Share your pics with me on Instagram, just tag me @lemonthy.me! Also feel free, as always, to leave any questions, comments or suggestions below. Into a mixing bowl, add the peanut butter, oat flour, desiccated coconut and maple syrup. Using a wooden spoon, stir until everything combines. You can ditch the wooden spoon for your hands if it gets too thick as the warmth will make it easier to finish mixing. Using a tablespoon measurement, scoop out the mixture and use your hands to gently roll into little protein bites. This recipe should make about 13 protein bites. Store them in a container or jar in the fridge and enjoy! 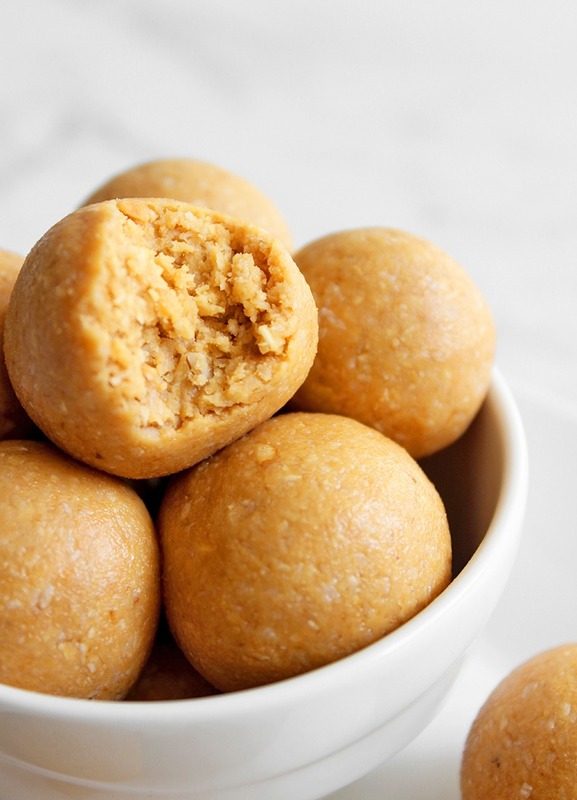 * You can use smooth or crunchy peanut butter depending on what you like best, but smooth peanut butter will make the protein bites easier to roll.